I've got some ideas for how to handle burning terrain that I want to run by everyone. Particularly Eriochrome, for the mathematical take on it. When a weapon with the "Incendiary" rule is fired at, or into a piece of terrain, you roll two D6 dice, one after the other. Subtracting the second roll from the first. If the result is positive, then that terrain piece is on fire, with a "Burn Strength" of whatever the difference between the two rolls was. Example: I roll a 4, and then a 2. The result is a S2 fire on that piece of terrain. If something is "Flammable", you get to roll 2D6 and pick the highest die instead. If you roll doubles for either method, no fire. So let's say that you want to move through some terrain that's burning. Small fires are easier to navigate. While big fires are hard to see paths through, scary, etc. So you would subtract the terrain's current burn strength from your movement after all other penalties are applied. So in the above pic, the pawns would normally have 1/2 movement through the woods. Which would be 6" if moving At The Double. That's further reduced by 3", for the current burn strength of the woods. So they can move 3" into it from where they are. Ok, so you've moved into a wood. What happens next? Well, during the end phase you'll roll 2D6 for each piece of burning terrain again, the same as before. So normal terrain rolls 2D6 and subtracts the second die from the first. 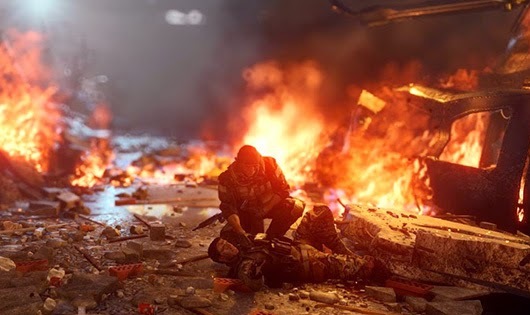 If the result is negative, the fire goes out. 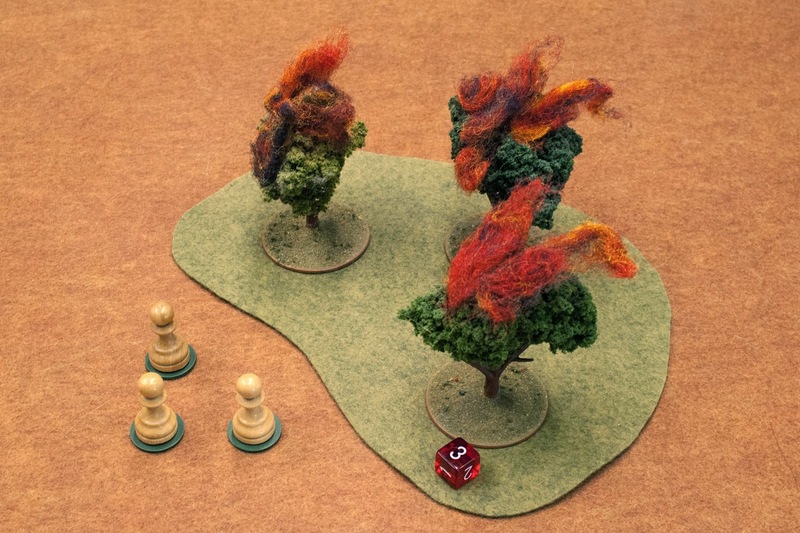 While for flammable terrain, you roll 2 dice and pick the highest. If either comes up doubles, the burn strength will be zero during the following turn. But the terrain will still technically be on fire. So you'll roll again next turn. All of this happens in the End Phase, so that units moving into woods have to gamble on what the burn strength will be during their next turn. Because if you start the movement phase in burning terrain, you'll take an automatic hit on each model. With an AP and Strength equal to the terrain's Burn Strength. With bonuses to your armor if you're fully enclosed.